1. Preparation – This is the thing that makes the biggest difference, but is also hardest to keep on top of. In practical terms, Quibble and Squeak’s clothes for the morning are chosen before bedtime, breakfast things are put out ready and nursery bags are checked in the evening. We have a store of children’s birthday cards and suitable presents, to avoid panics the morning of a birthday party, and I use my phone to remind me in advance of themed nursery events requiring costumes, reply slips or payments. And I choose three busy bags to put out for Quibble each day to combat that moment when I’m elbow-deep in cooking and he whines ‘I’m bored of my toys, Mummy’. 2. Share the load – As we both work, Stanchion and I divide up the household responsibilities between us. Some we alternate (early morning get-ups), some we take sole responsibility for (washing or cooking), some we know we just both need to do. Quibble is getting to an age where he can help by laying the table or tidying up toys, for example. Even Squeak will play a game of putting things in a toy bin (although we have to be quick to move her before she empties it again). And if grandparents offer to help, we take it (with lots of ‘thank you’s!). 3. Structure free time – It is tempting to either try to get jobs done or just relax at the weekend, but not only is that not fair on Quibble and Squeak, it means I miss out on playtime. By making sure that at least one of us does some sort of fun outing with the kids (even just walking to the swings), they get a focus to the day and we get to have fun together. During Squeak’s naptime, we try to have a more relaxing time for us and Quibble – watching a TV programme, playing a quiet game or reading books – and having had some quality time, he’s often happy to play on his own for a while so we can get things done. And if either of us need to go and run an errand, we take a child with us – chatting in the car or on the walk gives them that precious one-to-one time. 4. Use cheats and shortcuts – I often read the blogs of stay-at-home mums where they have spent time creating fantastic busy bags or craft activities for their children that I wish I had time for. 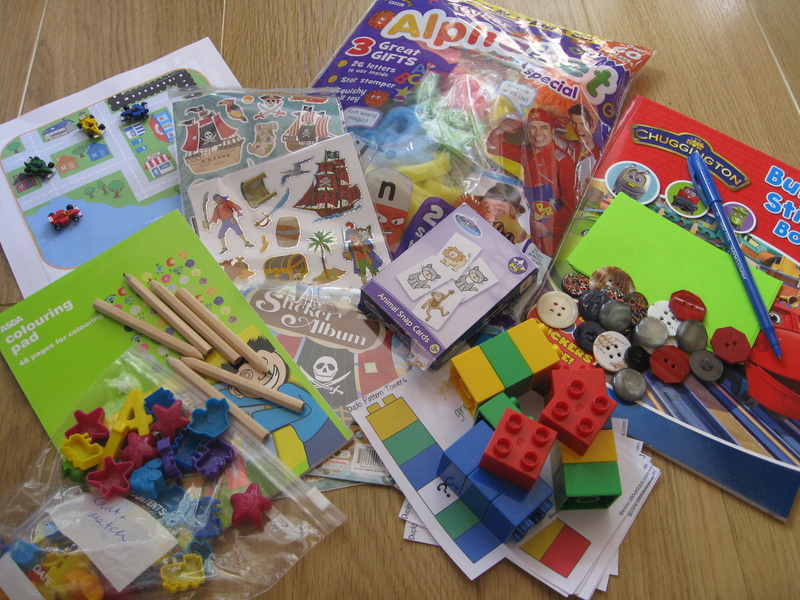 Luckily, there are hundreds of cheats and shortcuts that can be used, so Quibble’s busy bags contain things jigsaw puzzles, magnet games or stickers. They still entertain him, but take very little time to put together. I buy Mister Maker craft sets when I see them on offer, I steal (‘borrow’) the good ideas that I see my friends doing on Facebook, I shop online to avoid travelling to supermarkets and we also have a cleaner: anything to give us more family time. 5. Cut yourself some slack – This might make it sound like things always run smoothly in the Commonsense house, when of course they don’t. Plans get derailed, things get forgotten, chores stack up. It isn’t possible to do everything all the time. And when time is short, I don’t want to waste it on guilt or worry. In the words of Scarlett O’Hara; ‘After all… tomorrow is another day’. I hadn’t heard of Busy Bags until a friend recommended them to me as a way to keep Quibble occupied when he had to wait; while I was cooking dinner or taking Squeak for her jabs. I look them up on Google and Pinterest and quickly realised that most people who were showing their Busy Bags had at their disposal a colour printer, a laminator and hours in which to put their educational and arty bags together. I have a printer that always seems to be out of ink, no time and I didn’t even know you could buy home laminators. Pen and post-its – Any sort of pens (an ordinary blue biro is a winner in this house) with a third of a pack of sticky notes. Coins or buttons – I came across the pot we’ve been keeping foreign coins in and emptied some into an envelope, while a pot of spare buttons from clothes I no longer own has been tipped into another bag. A friend of mine has done the same with a few different bottle tops. Quibble loves pretending to buy things, looking for the numbers, sorting them by size or colour and counting them into pots. Duplo patterns – Two or three blocks each of four different colours is enough to make some different towers and if you have a colour printer, add in these printables to get them making specific patterns (I didn’t print them on card or laminate them). Quibble loves working out the patterns for a few minutes, but then just building towers in different patterns. Small cars or motorbikes – I use the really little ones that come with magazines or in crackers, but anything small enough to go in a zip bag would work. You could also get a printable road map like this for them to go on. Magazines – ultimately lazy (and no, you don’t have to put it in a really big zip bag), but Quibble is immediately interested because everything is new. In reality, he wants our help with the stickers, activities and stories the first time, but after he’s heard them, he will just flick through them on his own. Quibble loves playing with the free toys. Colouring books and colours – Just a small packet of pencil crayons (ours came free with a pub meal) and a little colouring book or a few colouring sheets, dot-to-dots or mazes (like these) printed out and folded into a bag. Quibble loves ignoring the picture and scribbling wildly with every colour. Matching numbers or colours – We have a set of number fridge magnets, but no fridge door for them, so in they went to a bag with some different counters that came free with a magazine. If you had numbers on beads or tiles or just some dice they would work just as well. I’ve also seen it done with coloured card to match the colours of the counters. Quibble loves using every sticker on the sheet including the title and copyright. Cards – We have a couple of packs of themed cards for pairs games (including one that came free with a magazine – you may be noticing a theme here!) and they can be used for Snap, Pairs or grouping similar ones together. Quibble loves spreading them all out to look at to find his favourite ones, who quite often talk to each other. Jigsaws – they pack up very small without the box and for even more challenge when the puzzles are very familiar you could put more than one in the bag. Quibble loves sorting out all the pieces and then commentating on how he is putting them together (‘So you’ll know for next time, Mummy’). Although she can’t have the zip locked bags, I haven’t forgotten Squeak. We put some toys and other objects (mini hairbrush, bangle, food clips, pastry brush, unwanted flyers, for example) into a little box, cloth or paper bag and her curiosity gets the better of her for at least a few minutes. So spread the word. Busy Bags are useful and they can be easy too. I’m sure there used to be more time in each day. After wrestling the children to sleep, cooking dinner and eating it, there seems to be just enough time to put a load of washing on, load the dishwasher and tidy up the toys before bed. Sometimes I lie in bed, mentally listing all the hobbies I’d like to have time for. I remember how I used to do a yoga class on a Saturday morning, have breakfast in bed with the Sunday papers and spend long, lazy hours reading books. In the summer, I used to paint my toenails to coordinate with my outfit. But instead of breathing deeply through downward facing dog, I spend my Saturday mornings splashing about in a swimming pool with Squeak and watching Quibble gain the confidence to jump in on his own. The last newspaper in our house was used to protect the table while Quibble stuck glitter onto his dinosaur picture. And I do still spend hours reading, it’s just that the books are bigger, with fewer words and more pictures. If I’m honest, I love it. I wish I could pause it sometimes and have a little time out, but this won’t last long and I don’t want to waste it. Every year Quibble and Squeak will need me a little bit less as they grow that bit more self-sufficient and I will get time for hobbies again, slowly but surely. When look back on this summer, I know I won’t remember what colour my toenails were (or care that they weren’t even painted). But I hope I’ll remember how Squeak learnt to say ‘Mama’, how Quibble learnt the letters in his name and how much my kids made me smile.